The train from Yiwu used existing rail links to run to Iran. China proposes to build new high-speed rail links through Central Asia. Trains carrying Chinese goods will then not terminate at Tehran but run further on to European markets. Besides facilitating Sino-Iran trade, these rail lines will contribute to Iran’s emergence as an important Eurasian trade hub. They will generate income for Iran from transiting trains and integrate it more firmly into the economies of East and Central Asia as well as Europe. This investment in internal and trans-border road and rail connectivity has resulted in a massive network that connects China with different parts of Asia and Europe. There is, for instance, the roughly 13,000 km-long railway line – the world’s longest – linking Yiwu with Madrid. Thus the Yiwu-Tehran railway is “just one of the many projects that enhance regional connectivity, bringing together China, Central Asia, the Persian Gulf and West Asia,” observes Bhatnagar. Analysts have compared China’s OBOR project through Iran to the one that runs via Pakistan. Unlike the China Pakistan Economic Corridor (CPEC), which runs through Pakistan’s insurgency-wracked Khyber Pakhtunkhwa and Baluchistan provinces, the route via Iran “faces fewer security threats,” argues C Raja Mohan, a noted Indian strategic affairs analyst. What is more, “while building a railway over the Karakorams is a major engineering challenge, China’s Iran corridor only needs to modernize the existing road and rail links between China, Central Asia and Iran.” The Iran route thus has “more chances of success” than the CPEC route to the Arabian Sea, he points out. India will be watching China’s OBOR infrastructure-building in Iran closely. Hitherto, it has responded warily to the OBOR initiative in general, opposing it as a unilateral Chinese initiative that Beijing is pursuing in its own strategic objectives. Indian opponents of the OBOR have described the Maritime Silk Route, for instance, as a “benign-sounding new name for Beijing’s ‘string of pearls’ strategy’” to encircle India. Thus India should not participate in CPEC, which runs through Gilgit-Baltistan, over which India has territorial claims. 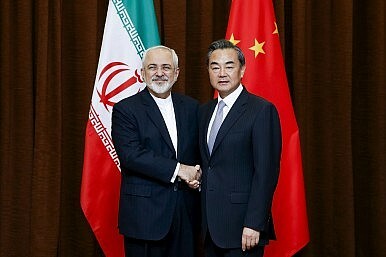 However, it should work with Iran and China to develop Iran’s trade and transport infrastructure. “Instead of seeing Chabahar [port] as an Indian rival to China’s Gwadar project in Pakistan, Delhi should offer to work with Tehran and Beijing to develop Iran’s ports and enhance its road and rail connectivity,” Saran argues. This would be in India’s interest, as it has been eyeing overland access via Iran to Central Asian markets for some time now. With Tehran poised to emerge as an important transit hub in the Asia-Europe trade, India would gain overland access to Europe as well.